This quick tip is to show you how to update hundreds of links throughout your website with one click. Here are three ways to insert and update links in your blog to save you hours of frustration later. I use and highly recommend WordPress and BlueHost with the Total Theme from ThemeForest. First, install the Pretty Link plug-in. Pretty Link is a tool that will help you maximize your efficiency if a link from an affiliate should ever change. Also, you can have the affiliate link look like an actual webpage address rather than be filled with a bunch of numbers and letters. Personally, I think this looks more professional and less spammy. Go to Plugins and Add New. Search for Pretty Link and Install Now. Once it is installed and activated, you will see it in the Dashboard on the left side panel. 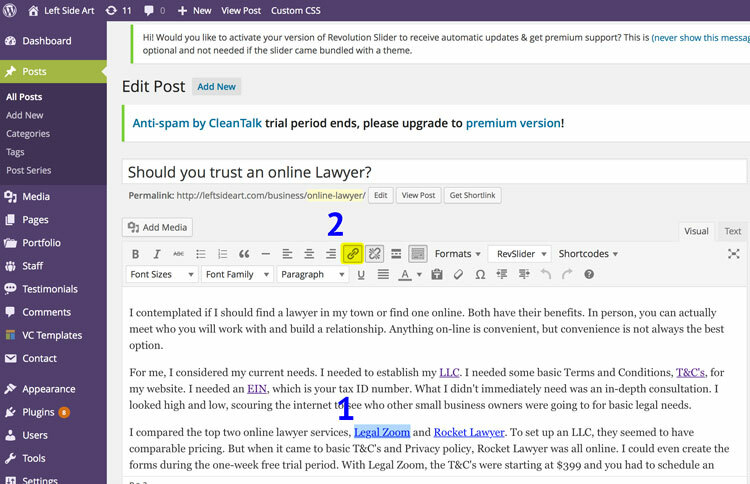 For this example, I'm going to show you how I did all three of these links in my "Should you trust and online Lawyer?" blog. Notice I have "LLC", T&C's", and "EIN" as a link. Each of these links will take you to my "Get started the right way with an LLC or Corporation and the SCAMS you’ll want to watch out for" blog. This new window will pop up. Now, here are a few things you want to pay attention to. The Search function will find other posts that you created. For this example, I started to type in the name of my blog I wanted to link to: "Get started the right way with an LLC or Corporation and the SCAMS you’ll want to watch out for". Once it showed up in the list, I simply clicked on it and the URL and Title auto-populated. Easy! My preference is to leave the "Open link in a new window/tab" unchecked when I'm linking within my own site. "Backlinks, also known as incoming links, inbound links, inlinks, and inward links, are incoming links to a website or web page. In basic link terminology, a backlink is any link received by a web node (web page, directory, website, or top level domain) from another web node. Inbound links were originally important (before the emergence of search engines) as a primary means of web navigation; today, their significance lies in search engine optimization (SEO). The number of backlinks is one indication of the popularity or importance of that website or page (for example, this is one of the factors considered by Google to determine the PageRank of a webpage). Outside of SEO, the backlinks of a webpage may be of significant personal, cultural or semantic interest: they indicate who is paying attention to that page." This method will also apply if you want to link to a page within your site. Simply type in the location of your page. For example, I would have typed in http://leftsideart.com/inspiration for the link if I wanted to take someone to my Inspiration page. I use this method not only to link to external webpages, but also to act as a placeholder for a pending affiliate authorization - refer to step 3 for more detail. Let me explain: If I have a post that I want to get out there, but my approval for an affiliate hasn't yet come in (some take 2-7 days for approval), then I can easily go back and update the link after I'm approved. Going back to my example post, notice how I have "Legal Zoom" and "Rocket Lawyer" with an active link (you can tell because it's underlined and a different color than the rest of the text). I'll be using Legal Zoom for this example. Before you actually insert a link into your post, go to your Pretty Link plug-in and add new. In the image below, your "Target URL" is simply the home page for Legal Zoom. This may be temporary if you are waiting for an affiliate link - refer to step 3 if this is the case. I literally go to the home page of whatever site I'm inserting, in this case it's Legal Zoom. I then copy/paste the home address straight into Pretty Link so there is no room for error. 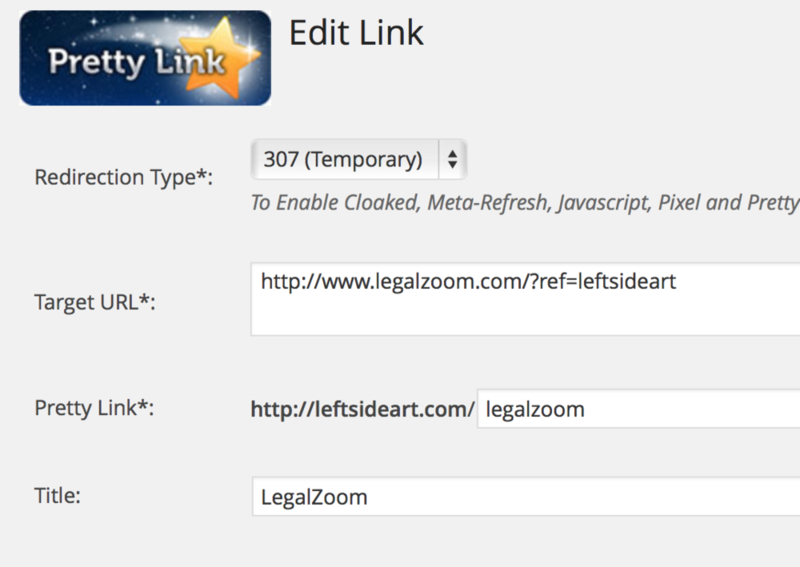 For the "Pretty Link" box, this is where you will type an accurate description, such as simply "legalzoom". This is the Pretty part. You have the option of putting whatever you want in here. Then, title the link. I usually stick to what I put in the Pretty Link box for simplicity. In the image below, I also show you the additional options checked to what I consider to be my default setting. Now, go back to your post to edit the link in your text: In the same manner as in the first example, highlight the word and use the "Insert/Edit Link" button in the toolbar to place your link. Notice in the image below I created a link for Legal Zoom as "http://leftsideart.com/legalzoom" which is exactly how it was typed in Pretty Link. The Title is simply what will show up when someone hovers over your link. I usually put the website name, but you can instead be more descriptive with something like "Legal Zoom - affiliate link" for more transparency or "click here for ....". You can also leave the Title blank. I opt to have the external websites that I reference to open in a new window/tab. There are several reasons for this with the primary reason being I want to keep people on my page. If the webpage automatically changed over from my webpage to someone else's, how likely is someone to navigate back to my site? That's something for you to think about and consider. Remember: The reason why we are doing this step and not just directly inserting a hyperlink to the text in the post is to be able to come back to Pretty Link and update Legal Zoom's home page to an affiliate link once I get approved. If you find that one of your existing affiliate links have changed, or you are now an affiliate of a site you previously referenced (step 2), then you can easily update you link in Pretty Link! Go to Pretty Link and update the Target URL with the new address. It is literally that simple. This will save you a huge headache and many hours of nonsense work if you needed to go through each and every post to do these updates manually. Within WordPress, you can manually change the Permalink for your post. Let's say you linked one of your posts to another post as we did in step 1. Later, you decide you want to modify a Permalink to the post you linked to. WordPress automatically updates your links! This saves you time from having to create Pretty Links for your individual blog posts. If your newsletters that you develop in Mail Chimp or similar program has links back to your post, be careful when you change your permalink. You will have then go into Mail Chimp and update your link manually. Now check out Pretty Link plug-in: there's the free license, developer, and blogger packages. You'll be able to find what you need for your site.